If you regularly update your Facebook page, you might have noticed #posts #like #these. These are called hashtags. Yes, they do serve a great purpose to certain websites, but they have been overused—let alone abused—by social media enthusiast. What I see every day is the use of unnecessary and irrelevant hashtags, like #hahaha, #this #is #amazing, #huhu, and the likes. It was annoying enough when Facebook did not support hashtag use before, but it is even more annoying now more than ever. Most people use them, but they seem to have no idea what they are and how to use them. But what is a hashtag? How does it work? And how does one use it properly? The use of a hashtag makes it possible to group messages in a certain social media platform, since one can search for the hashtag and get the set of post that contain it. It is not there to simply tell people what you are posting about. By clicking or tapping the hashtag in a post, you can see all the other posts that contain the same hashtag and see what other people post about the same topic. However, a hashtag is only connected to a specific medium and can, therefore, not be linked and connected to pictures or messages from different platforms. How Does One Use It Properly? 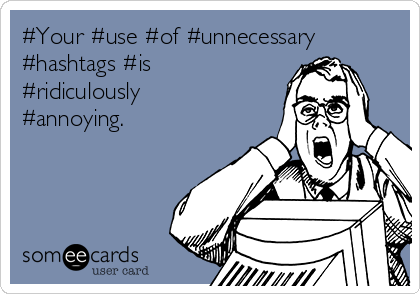 I kind of #hate when #people use #hashtags for #genericwords all over their #tweets. How to use your 3 iron In the winter? Hang #homemade #salami from it. Again, hashtags are used to sort posts of certain relevant topics within a social media platform. However, most people think—as to what I have observed—that hashtags are mere visual representation of the topic of their posts to let people know how they feel and what they think. It does not work like that. Although the use of generic words as hashtags could be sometimes applicable, hashtags need to be specific and direct to the point—the main idea of your post. For example, start-out companies and business invent hashtags to promote their products and/or services for people to easily see the posts about them. Bigger companies, however, use specific hashtags for their campaigns to go viral. So use direct-to-the point hashtags. Also remember that because you can does not mean you should: you can post something without using a hashtag, especially when it has no relevance to the greater good. Also, there is a certain “limit” to the use of hashtags in a post as the quantity of hashtags used in a post or tweet is just as important as the type of hashtags used. Currently, it is considered acceptable to tag a only post once when contributing to a specific conversation (thus, tag the topic of the conversation). The us of two hashtags are considered acceptable when adding a location to the conversation (like the venue of an event). Three hashtags are seen by some as the absolute maximum, and any contribution exceeding this risks “raising the ire of the community.” (It is also wise to remember that when using multiple hashtags, a single space should be inserted between the tags [thus, #hashtag1 #hashtag2, not #hashtag1#hashtag2]). Aside from frustrating other users, the misuse and abuse of hashtags can lead to account suspensions on some social media platform. Twitter warns that adding hashtags to unrelated tweets or repeated use of the same hashtag without adding to a conversation could cause an account exclusion from search filter, or even suspension.